The geode has water at its center, like an alien being with a brain. If I’m not careful, it will end up smashed on the ground, lying in a pool of its own water. “If you’re afraid it will die”, people often ask, “aren’t you killing it by sanding through?” It’s true. I am killing it slowly compared to a human with a hammer, but quickly compared to a trickle of water. Hand-sanding has made my hands so strong that everything feels soft and light. Even the geode itself seems like it will crumble under the touch of my superhuman hands. It’s also toughened my skin: callouses on my fingers made me continuously re-calibrate, and ultimately disable, the touch ID on my phone. 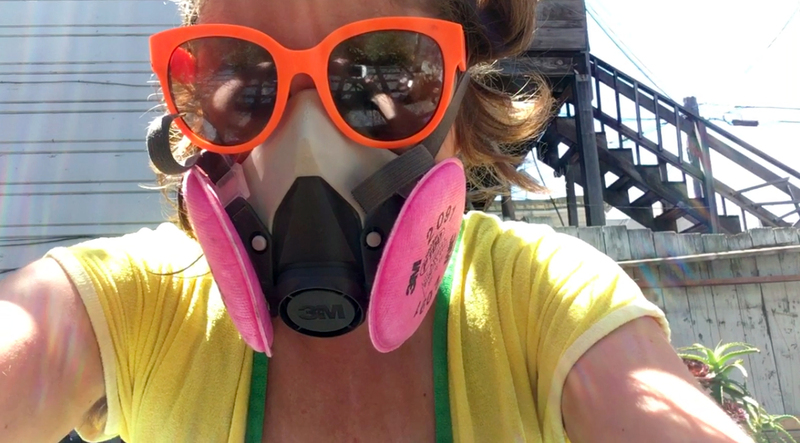 About a month into sanding, jewelry-maker friends began telling me to get a respirator. Apparently microscopic silica particles are light, invisible, and carried on the breath. I purchased a respirator and stopped sanding indoors. When I first saw the water inside the geode, I thought of it as an alien. But I have to wear this mask, so who’s the alien now? 3. It helped me solve a mystery. A month into the project, I fell off my bike and sustained a concussion and amnesia. I visited the site of the crash and inspected the huge pothole that had caused it. How had I missed something so obvious? I returned to my geode, and soon saw the water in the geode for the first time. “It’s full of water” I demonstrated. Then I remembered the heavy rain the day of the crash. 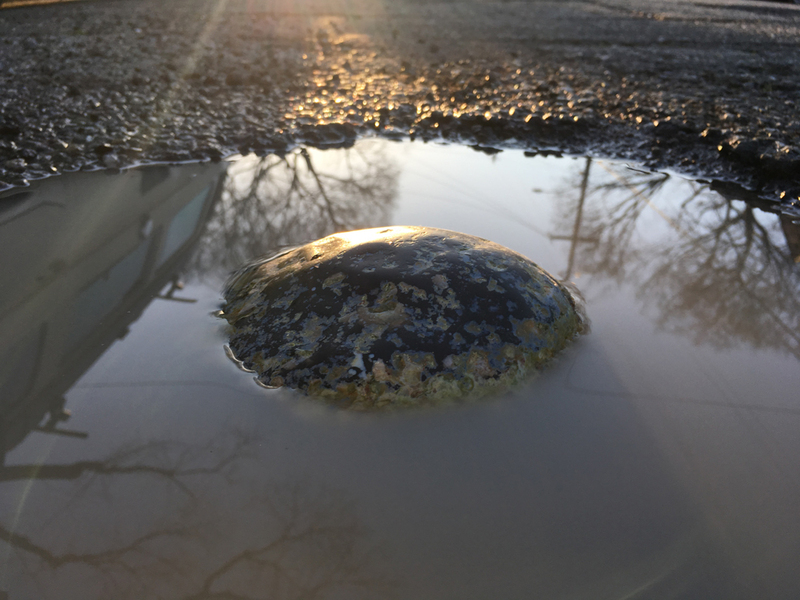 I hadn’t seen the pothole because it was full of water, and I thought it was a puddle. 4. It’s inspired oil portraiture. As I sand, I uncover tiny inclusions in the translucent black parts of the rock. They have depth to them, disappearing into the rock like something frozen in ice, each layer emerging, then disappearing, as I sand through. These moments are temporary, and photos were unsatisfying, so I began to do paintings. 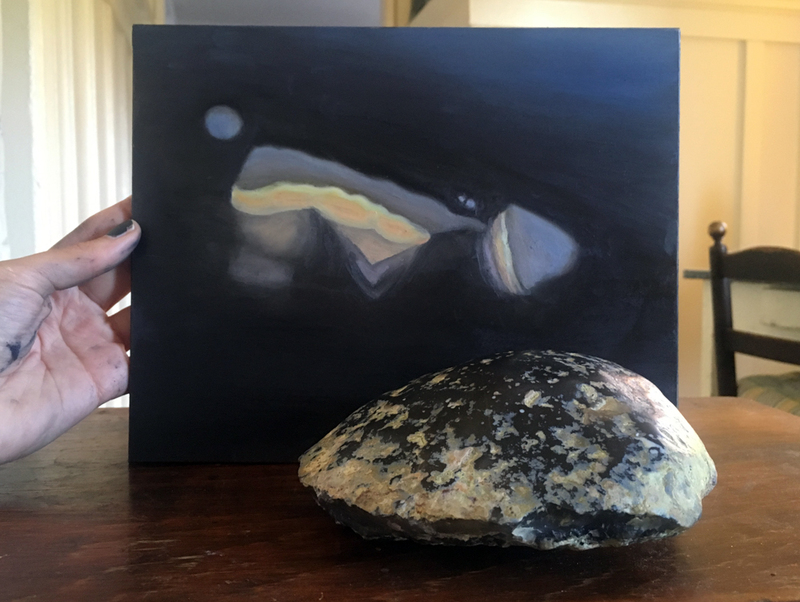 This 8×10-inch oil study reflects about 1/4 inch of the geode. 5. It makes me care about geodes who are broken and forgotten. Of all the geodes people have opened, how many are cared about? I imagine them covered in dust on a shelf, or by a peeling label in a rock-collector’s garage, or made into a forgotten pair of earrings. Having a geode who has come alive has made me notice precious objects tossed aside by humankind. A cracked tortoiseshell comb collecting dust at a thrift store, uneaten buffalo wings in the hot sun, an unsold lot of shark’s tooth bracelets. My own childhood rabbit’s foot in a junk drawer. Geodes are held up as sacred magical objects by some, and focused on as part of scientific inquiry by others. To me, devoting time and energy to something so beautiful and mysterious makes that thing powerful. Now that my geode is alive, it’s a comforting friend, a starry night to stare into, and a seemingly never-ending place to explore, layer by microscopic layer, until all that’s left is dust.